Fall, crisp weather means football season. Practices til dark and weekend games. Be sure to honor your coach with a thank you gift at the end of the season. Give your favorite Coach a great Personalized World’s Greatest Coach Ornament to say Thank You for all the effort and time put into coaching your team. Honor your best Coach with this unique Personalized Coach Keepsake from the entire team. 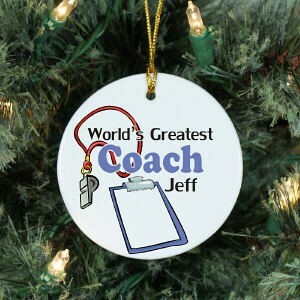 Our World’s Greatest Coach Ceramic Ornament is a flat ornament and measures 2.75″ in diameter. Each Ornament includes a ribbon loop to easily hang from your Christmas tree. Includes FREE Personalization! Personalized with any name. Great for holiday gifts or as a end of season gift for your coach. Have fun watching your favorite football games as your sporty Personalized Football Player Ornament hangs from the Christmas tree. This Personalized Football Fan Christmas Ornament makes a great stocking stuffer gift idea for all our sports fans to admire year after year. Our Ceramic Football Christmas Ornament is a flat ornament and measures 2.75″ in diameter. Each Ornament includes a ribbon loop to easily hang from your Christmas tree. Includes FREE Personalization! Personalize your Football ornament with any name. One of our favorite gifts, however, is the Personalized Whistle. A perfect gift for a coach, teacher or athlete! This stainless steel whistle comes with a 30-inch black cord lanyard. Engrave a special phrase in portrait or landscape on the top front or engrave a monogram for a classy look. Please allow 4-5 days for personalization prior to shipping. Or, search a list of other coach gifts for one that will be perfect for your child to give as a thank you at the end of the season. 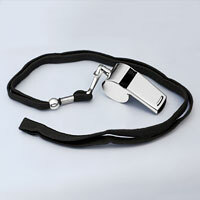 This entry was posted on October 28, 2010 at 10:34 pm and is filed under Coach Gifts, Football Gifts with tags Coach Gifts, football coach, football gifts, football ornaments, personalized whistles, thank you gifts. You can follow any responses to this entry through the RSS 2.0 feed. You can leave a response, or trackback from your own site.